Prep your vegetables and place the broccoli into a heat proof bowl. Heat an oven safe 10” skillet (preferably nonstick or cast iron) over medium heat for 2-3 minutes. Add 2 tablespoons of olive, ghee or butter (or a mix) to skillet. Once the fat is melted add the onions and a good pinch of salt and turn the heat to medium low. Cook the onions, stirring every few minutes, until they are golden and caramelized, about 15 minutes. Meanwhile, pour boiling water over the broccoli and cover with a plate for about 5 minutes. Drain the broccoli and set aside. Once the onions are very fragrant, golden and soft, add the broccoli and another good pinch of salt. Next add in the box of greens and cook until it is all wilted. Meanwhile, whisk 10 eggs with 2 good pinches of salt. Once all the greens are wilted add the eggs into the skillet and stir gently to evenly distribute the vegetables. Turn up the heat to medium high and cook for about 5 minutes until the bottom is golden. 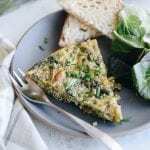 Transfer the skillet to the oven and cook until the frittata is set, about 15 minutes. Allow to cool for a few minutes before cutting into desired slices. Serve immediately.